What powers our web hosting? Manage multiple email accounts for your domain name and access them via POP, IMAP or Webmail. You may also create forwarders, autoresponders and fight spam with filters and SpamAssassin. Store your data in MySQL (MariaDB) or PostgreSQL databases. 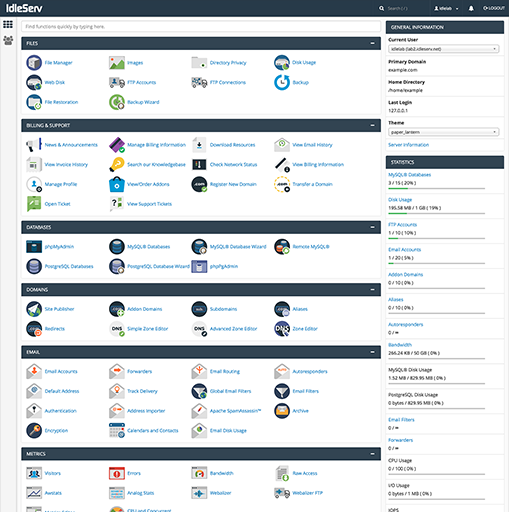 Easily create new databases and manage authentication via cPanel. We also provide access to phpMyAdmin and phpPgAdmin allowing you to manage your data with ease. Securely transfer files to and from your account via sFTP. Standard FTP access is also available. Access to your account via SSH is provided at no extra cost. Manage your hosting account with cPanel. It’s packed with apps and features to make site management a breeze. Create email accounts, manage your files and back up your data. Need to run a specific version of PHP? No problem, you can select either 5.2, 5.3, 5.4, 5.5, 5.6, 7.0, 7.1 or 7.2 for your website. Easily set up a Python application and install the modules you require via cPanel. You many run the 2.7, 3.3, 3.4, 3.5 or 3.6 version of the Python interpreter. Select from versions 1.8, 1.9, 2.0, 2.1, 2.2, 2.3, 2.4 or 2.5 of the Ruby interpreter and install the modules you require via cPanel. Select from versions 6, 8 or 9 to run your Node.js application. Environment variables and a startup file can be set up in cPanel. Our servers actively scan all new and modified files for viruses, trojans, malware and other malicious threats. All customers are completely isolated from each other with the power of CageFS. If a customers website is exploited due to a vulnerable script, the damage will be limited to their account and not you or the rest of the server. Our HTTP servers utilize ModSecurity web application firewall to help protect your website from attacks and other malicious activity. Securely access our services such as cPanel, POP, IMAP and SMTP with SSL encryption to make sure your user credentials and data remain secure. Free SSL certificates are also provided for your websites allowing you to secure all of your traffic. 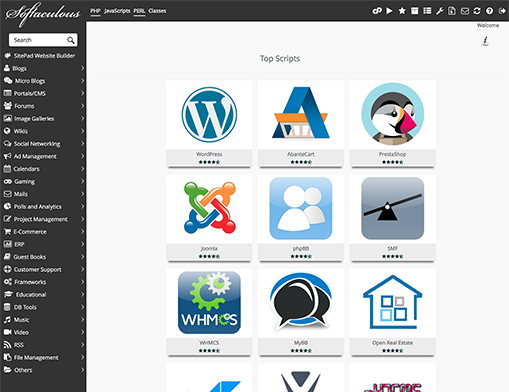 Want to quickly set up a blog, forum or a photo gallery? The Softaculous auto installer tool can get you running in no time. Softaculous has over 350 packages ready to install on your website with a click of a button.